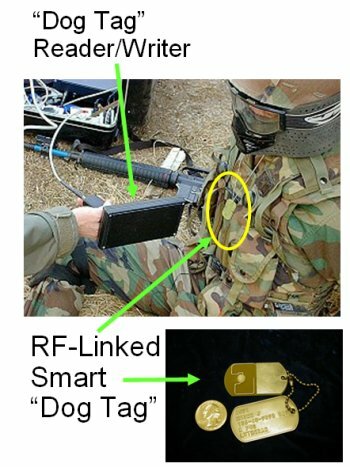 Smart dog tags are coming into greater use in the U.S. Army, according to StrategyPage. Smart dog tags are basically read/write RFID tags that you can wear around your neck. Some sort of "dog tag" or wearable information for soldiers has existed in one form or another for thousands of years; soldiers in ancient Sparta used them. During the Civil War, soldiers pinned paper notes inside their jackets. Manufacturers recognized a market, and started making pins and machine-stamped tags made of brass or lead. Official U.S. Army dog tags were first authorized in 1906; the information recorded included name, rank, company, regiment or corps. By 1916, two tags were included; one to stay with the body and the other for morgue record-keeping. By WWII, more information, like blood type and medical conditions were added. Smart dog tags can change all that; tags capable of holding megabytes of data are inexpensive. On such a tag, the entire medical and service history of the soldier could be recorded and worn around the neck. In 1995, an inventor named Hal Woodward impressed Department of Defense officials with his "digital dog tag"; he called it a Medi-Tag. The biggest issues with these smart dog tags are 1) toughness and 2) security. The tiny chip in the tag would need to be in a hardened case to survive an explosion that would kill the wearer; metal dog tags can survive explosions, fires because they are simple plates of metal. The problem of security is greater. The most obvious problem is having the enemy use readers to download information. Another problem is the fact that, if these devices are regular passive RFID tags, any RFID reader could activate them, even if encrypted data could not be read or accessed. I assume that the tags are designed to retransmit energy back to the reader only when an appropriate code has been received. Otherwise, an enemy could position readers in different areas, detecting "smart" tags that were passing through. This story keeps coming up; see my earlier story Pentagon Asks For Digital Dog Tags. Learn more about smart dog tags here and here.